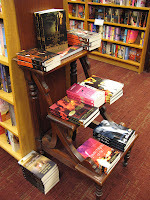 The Un-Official Blog of Romance Author Maddie James: Buy the Gift that Lasts Forever - Books! A couple of days ago I reposted the letter from the president of the Author's Guild, Roy Blount, Jr, talking about buying books for Christmas. I'm giving a lot of books this year, too, which makes sense because, a) I'm an author, and b) I work for a non-profit literacy organization. Books, and all they entail, are a passion of my life. I've put together some favorite lists, all available on Amazon, and thought I'd repost here for those of you who are interested in buying books for Christmas. Oh, and a trick I learned from my sister about buying on Amazon. She has children and grandchildren scattered all across the world. She has them go to Amazon and create their wish lists, then she picks books from their list and has them shipped straight to their homes. Cool, huh? Here are a few of my lists. If you are looking ebooks, you may also be interested in the wonderful books written by Resplendence Publishing authors available at their website or on Fictionwise. So, go buy a book and give it away this Christmas. Books are a gift that lasts forever!